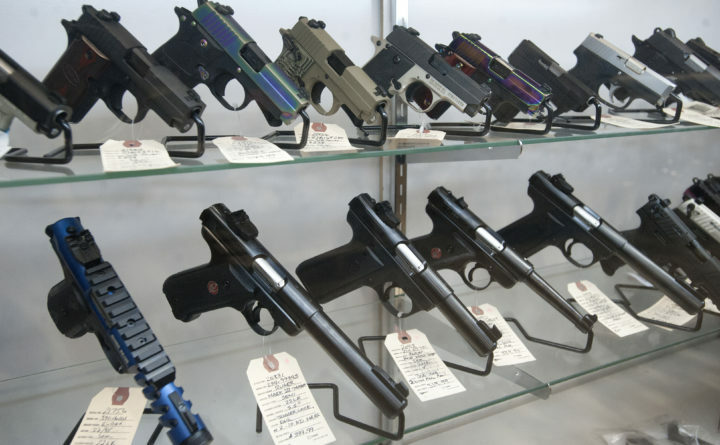 Handguns are offered for sale at Maine Military Supply in Holden. Many arguments against arming teachers are reasonable enough. Critics say more guns in the classroom could lead to negligent discharges, which happened as recently as Wednesday. Or their proliferation can spark chaos for police arriving to find an adult with a gun, leading to a bloody misunderstanding. But few have taken a public stance against arming teachers by declaring it would violate the feminine sensibilities of teachers. Alabama state Rep. Harry Shiver, a Republican, asserted that belief, saying that to protect “our ladies” — meaning female teachers — guns should not be placed in the hands of many who he believe are “scared” of guns. “I’m not saying all [women], but in most schools, women are [the majority] of the teachers,” Shiver, a lawmaker representing a district northeast of Mobile, told AL.com in interview published Thursday. Shiver did not respond to multiple requests for comment. The debate over arming teachers has raged since a former student entered a high school in Parkland, Florida, and killed 17 people on Valentine’s Day. President Donald Trump waded into the discussion a week later, saying “if the coach had a firearm in his locker when he ran at this guy … if he had a firearm he would not have had to run. He would have shot and that would be the end of it,” Trump said, referring to slain football coach Aaron Feis. Proponents of arming teachers have also said schools known to arm teachers would deter would-be assailants who would prefer softer targets. Shiver was voicing opposition to a proposed bill that would designate specially trained teachers and administrators on school grounds, requiring annual training of 40 hours that would include active shooter drills and firearm safety, AL.com reported. That bill cleared the public safety committee and was heading to the State House for debate. The lawmaker relied on his past as an educator to reinforce his position during the committee hearing Thursday morning. Shiver is correct about the demographic makeup. Nearly 80 percent of public school teachers were women in 2011-2012, according to Department of Education data. The connection to perceived fragility in women is less clear. Gun ownership was at a nearly 40-year low in 2016, as fewer people own more guns per person. Most gun owners are men. But gun ownership among women has held consistently since 1980 as ownership for men experienced a decline, TheTrace.org reported. About 1 in 5 women own a gun, Pew Research found last year, and they appear to view firearms as a pure self-defense tool at higher rates than men. While about 90 percent of men and women who own guns say it is used for protection, 27 percent of women say self-defense is the sole reason they own a firearm, Pew found. That’s more than three times the men who say the same, at 8 percent. That may not be surprising, given the apparent link between domestic violence and violent crimes involving guns.